Keeping It Going Over a Year Later…. 16 months and 106.5 later, my gastric sleeve journey continues here at Down the Scale. To keep me motivated, I thought it would be a good time to reflect on the positive habits I have made. I think it helps to remind myself of all the things that go into keeping myself healthy and happy as I continue to strive to lose weight. For me, the most important change I made was to eat smaller portions of healthier food. My smaller stomach helps with this, but I still need to think about what I eat and how much of it I eat. I prioritize my food by protein first and then vegetables. I eat fruit as a snack or part of my breakfast occasionally. I rarely eat carbohydrates as they fill my stomach very quickly. I haven’t cut them out completely, but when I do indulge, it’s usually only one piece of bread or a small portion of rice or pasta. I also have finally learned that I need to cut some foods out completely. Really, I wasn’t eating trail mix for the nuts…who does? And Chex Mix is banned from my home. I never once measured out either food like I said I would when I bought them. There are times I do need to measure my food and track it. When my weight loss stalls I find that recording my food intake helps. Using the app My Fitness Pal is an easy way to keep an eye on my eating habits. I only have to do it for a few days to get back on track. A year does make a difference! 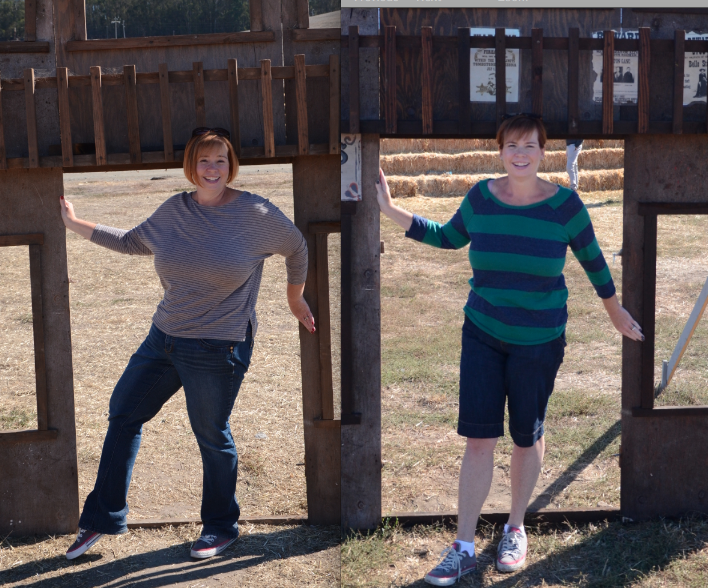 On the left is last year’s visit to the pumpkin patch four months after my surgery. On the right is this year’s photo. I’m looking forward to comparing these to next year’s photo! I also use My Fitness Pal to record my weight. I “officially” weigh-in once a week. Making my weight only count once a week keeps me from focusing solely on the numbers in my weight loss journey. While I would still like to lose seven pounds, I prefer to concentrate on maintaining my current weight loss. To do this, I have a “weight window.” It’s a five-pound range I want to stay in. This keeps me aware of my weight, but allows for those weeks where I indulge a bit. If I go above the window, I start tracking my food immediately. If I go below the window for a month I know it’s time to adjust the window. I just changed it a month after my hernia repair and tummy tuck surgery since I lost about nine pounds. Some of that loss was from the excess skin removal and lack of eating after surgery. Now that I’m a month out and I’m maintaining a new weight, I adjusted the window to keep myself on track and motivated. Exercising is a big key to maintaining much of my weight loss. And when I say exercise I don’t necessarily mean exercise in the sense of a dedicated activity for a set of amount of time. I do think that kind of exercise is important and I’m looking forward to running once again. And I do know that I must start weight lifting to tone my body. But I think it’s the everyday physical activity that is essential to my healthy lifestyle. Walking as much as I can is extremely important to me. I could tell how much both physically and mentally I missed walking during my surgery recovery. Now that I’m back to walking my kids to school, I am happier. Adding more activities to my week keeps me healthy physically and mentally. 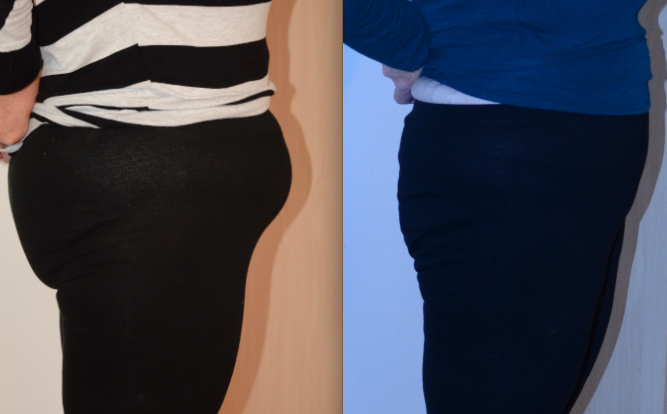 A month has passed since my abdominal hernia and tummy tuck surgeries. How am I doing? Honestly, it’s bad. Honestly, it’s good. Yes, I’m a bit wishy-washy about how I feel about my surgery. Just as there are two sides to a coin, there are two sides to my recovery. Let’s talk bad and get it out of the way. The worst part is that I feel like Frankenstein. I have a large incision from hip to hip. It’s pinkish with a few scabs here and there. At each hip, the incision is bumpy and ridge-like. My lower abdomen is swollen and my abdominal muscles hurt from time to time. Beneath my clothes, it’s just not very pretty. Here I am about 3 weeks after hernia repair and tummy tuck surgery. 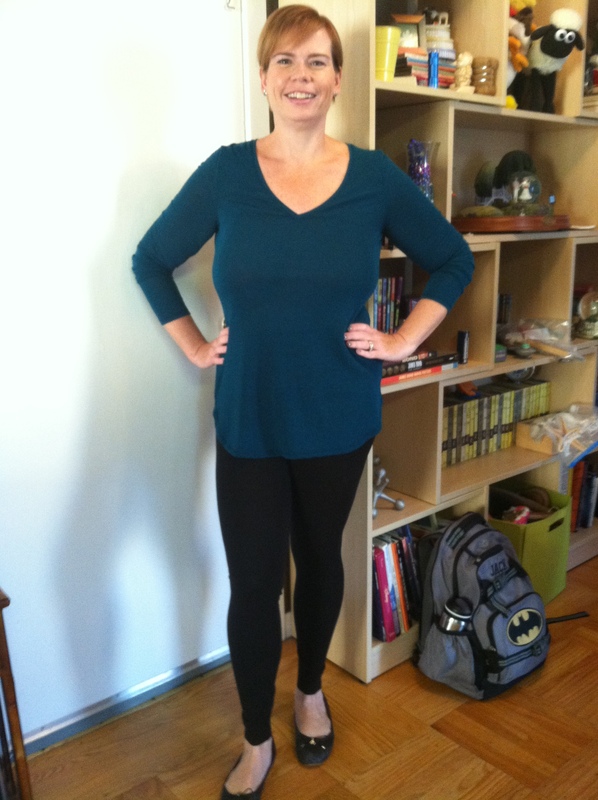 It feels amazing to have lost 105.5 pounds since my gastric sleeve surgery! Since my surgery, I have been concerned that I was healing properly. I meet with both my hernia repair surgeon and plastic surgeon last week and I finally was reassured. Dr. J. said my hernia repair went well and I was in good shape. He gave me his approval to start moving more and to even run when I’m ready. Phew! My meeting with Dr. C., my plastic surgeon, was even better. I disrobed and he took one look at what I considered to be my horrible stomach and said everything looked great. Really? I pointed out parts and he said the healing was all completely normal. The ridges on my hip incisions would settle in time. The incision was healing properly. He had no concerns. I had to laugh when he told me the scars would lessen in time and would be like my c-section scars. I actually never saw my c-section scars due to my large overhanging stomach! My concerns lightened even more when Dr. C said I could be swollen for 9 to 12 months after surgery. Even with all my scars and swelling, I will admit I think I look pretty good right now…with clothes on. Considering how far out my stomach protruded before surgery, my stomach seems pretty flat to me. I am now excited to see how it will look a year from surgery. More importantly, I feel good. The first few weeks, I was very achy and scared that I would be sore for a long time. A month later, I am sore at the end of the day, but I can get around much better! I’m back to walking my kids to school. Both doctors gave me approval to start running as long as I feel up to it, so I have committed to my third Turkey Trot 5K on Thanksgiving. I don’t expect to run a personal best, but if I run any of it, I will be thrilled. 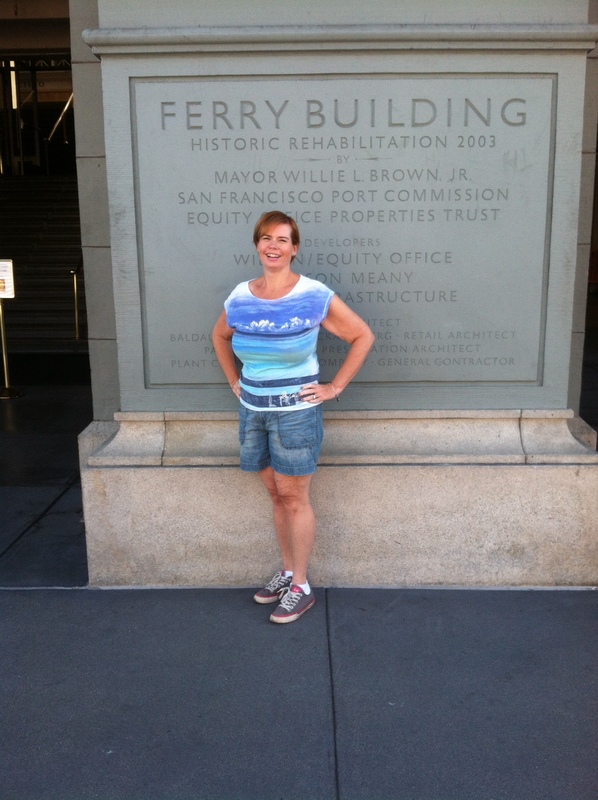 I am just happy to get back to being the active person I became after my gastric sleeve surgery. My surgeries were not the easiest procedures I have been through, but I don’t regret them one bit. Everything I do from surgeries, to eating better, to exercising, are all part of my overall plan to be a better me. Looking good on the outside is great, but feeling healthier and happier are the best rewards.